Ah, the 80s, back when home computer was making a rise in homes around the UK, me with my Commodore 16 and then eventually the C64. Handheld devices meant a Speak and Spell, the Donkey Kong game and those cool binoculars that housed a really simple racing game. Hacking was a cool but mysterious thing showcased in movies such as Hackers, Sneakers, Freejack and even Tron (ok, no major hacking but it is my favourite computer based movie, so I had to include it – plus the artwork on the box has a grid like Tron). However, this isn’t a review of the best times in the 80s, no. This is about a new micro game that is currently on Kick Starter. That game is called Super Hack Override by Weird Giraffe Games. This is a small card game that plays from 2-6 players and lasts between 5-30 minutes depending on the tactics employed by the players. 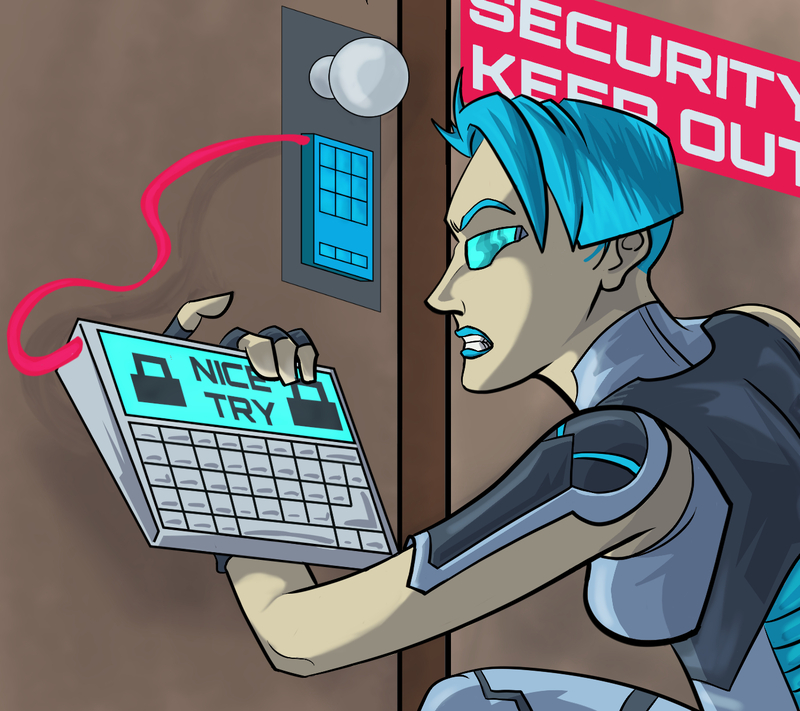 The premise behind Super Hack Override is that in the year 2000, an individual known as the Supreme Super Hacker (impressive title) has issued a challenge across the lands for the hackers of the world to prove that they are the best, that they are worthy of adopting the title and legacy. Thus, battle spring up across the land where hackers attempt to hack systems in order to increase their cred and prove that they are the chosen one. Super Hack Override comes with 25 cards or hacks, there are a set number of hacks that have a value from 1 through to 10. The objective is to execute hacks and score over a set limit. This score is dependant on the number of people playing. In a two player game, the score to reach is 40 which seems a lot but it is a score that is achievable. To keep this review short and not really go over the rules, the choices that each player has at their disposal is pretty straight forward. They can either play a card from their hand (which is referred to as face-in) and flip it in their hand to activate the hack. That card is now facing out to their opponent and the value of that card counts towards their hacker cred. They are that one step closer to becoming the Supreme Super Hacker. Ok, so the first player has executed a hack, what the second player can do is perform the same manoeuvre and activate one of their own face-in cards. However, they don’t want to do that, the game has progressed and they realise using their elite maths skills, that their opponent is 8 points away from being the winner. So what can they do? The choice they have is to flip one of the face out cards that the opponent is holding and return it to players hand, thus reducing their street cred. In short, these are the main choices that a player has, which is good for a micro game, each player is not bogged down with an avalanche of “what to do now?”. The choice just comes down to what card(hack) they wish to play. Let’s talk about the cards. Each card has a value assigned to them which when played, count towards your Hacker Cred. The card has artwork that screams 80s, with it’s neon and bold colours. The descriptive text explains what the hack does and how it affects the opponent and their cards. Now, some of the cards are defensive in nature that prevent your hacks from being taken or in game terms, proxy swapped. Some cards like ‘Stolen Goods’ allow you to take an opponents card and place it in front of you (or face out in your hand). The card such as the ‘Sock Puppet’ hack allow you to interrupt an opponents move so that their attempt is redirected to that particular card. As you get more familiar with the game, you start to know the benefits of the cards and how to use them effectively. A player also has chances to ‘Proxy Swap’, or in simple terms, move cards from one player to another. It’s a good mechanic that allows you to employ the ‘take that’ element of the game to another person. The higher value cards that really bump up your score are the most risky, they have the most points but the cards valued from seven to ten are government hacks and the downside to playing too many hacks of this nature is that you can be placed in Hacker Jail and immediately lose the game. As a player, you have to be mindful of how many you are placing. In a two player game, if the player has four government hacks that have been executed at the end of their turn, then it’s – System Offline – . Game Over Man! So in conclusion, this game is for me, quite thematic, I like the theme and how retro it looks. The artwork is on point and I get the right kind of ‘feels’. The colours are brash and bold. Even the back of the cards has the 80s computer title sequence graphic that you would expect. Think how Tron looks with the grid lines and title font. They have it on point. When we played, we didn’t feel like any cards were overpowered or out of balance, the winning of the game came down to the players and not the hacks themselves, which seems right. In a real situation, it comes down to the experience and skill set of the Hackers rather than the tools they use. Which leads me on to the strategy of the game. We liked that there was no one way to win the game, while you don’t have that many routes to the finish, there are still enough tactics to employ each game. If one tactic doesn’t work, then the game does not drag on needlessly before you can employ another. 1) Hope that the other players are not paying too much attention to you as you play the government hacks and toe the line between freedom and jail. Do you want to risk it while using your defense cards to prevent people from hacking your hacks? If the luck is with you, you could play a value 10 card. On you next turn, play a firewall hack and then choose another risky government hack. You could potentially be half way to your goal in just two turns (if you are lucky). 2) Play the long game and erode the leaders cred by returning their cards back to their hands. The only problem is that you have to have a fine line between building your cred and reducing your opponents reputation. 3) You notice that they’ve played the risky game and have several government hacks out. If they are not careful, the other players could proxy swap their high value cards with the leader’s low value cards. Suddenly, that person is over the limit and goes to Hacker Jail. No hacking for you! In summary, You should get this game, Why? It’s a good theme that I haven’t seen in a while, for me, it’s a nice refreshing take on the whole hacking genre. It wouldn’t surprise me if there is a ‘zombie’ like resurgence. The games do not last that long which is a god send when you are on holiday with limited space and you want to have a quick game with minimal space. It’s easy to pick up and put down when you get interruptions from a phone call, putting the dog out or herding the kids back up to bed. Although we prefer the table to play on (as shown in the upcoming play through video), this game can be played without a surface which makes it ideal for playing in a queue, waiting around for the concert to start. Instead of face up on the table, the cards are flipped around so that they now face the opponent. With only 10 cards at most, the amount of cards doesn’t seem to be too cumbersome to play with. The only negative I have about this game is the lexicon of the game. Don’t get me wrong, it fits the theme but at first glance, it did throw me off and I am in IT so I understand the premise of what the terms mean. Proxy swap was the one that threw me at first until I sat down and read it and realised what it meant in pure game play terms. As with most games, the rule sheet was in hand for the first couple of games to really understand what hack did and what it did to a card or an opponent. However, you have to give credit to Weird Giraffe Games in that the rule sheet and corresponding cheat cards do break down the cards into what it does. With the above in mind, it almost suffered the fate of Netrunner. While Netrunner is a deep and interesting game, my wife couldn’t get over the lexicon enough to really appreciate the game and for a game of this nature and playing time, you don’t want to have to learn a bunch of terms for what could potentially be a 5-10 minute game. However, once we got through those first few games, the wife got into the flow of it and really enjoyed it. While this might not be the game of the year for me, this is the sort of game that I would carry around with me in my “man bag”, it’s the game that I would introduce to my work colleagues who are not board gamers but are IT minded. They would enjoy the theme and game play. It’s the “starter” to the game lunch/evening. Hopefully, by reading this review, you’ve come to appreciate what kind of game this is, it’s a nice light game that has enough choices to keep you engaged and coming back for more. The artwork is very retro that appeals to an old man like myself and I do think of the old 80’s movies when everyone was idealistic about computers and the internet wasn’t a refuge for cats and click bait and you got serenaded by the sweet tones of the modem. The game play is simple enough to enjoy and understand and for $10 dollars, it’s a game that you should snap up before it ends. Posted in Card Game, Kickstarter, Review and tagged Hacking, Micro Game, Weird Giraffe Games. Bookmark the permalink.